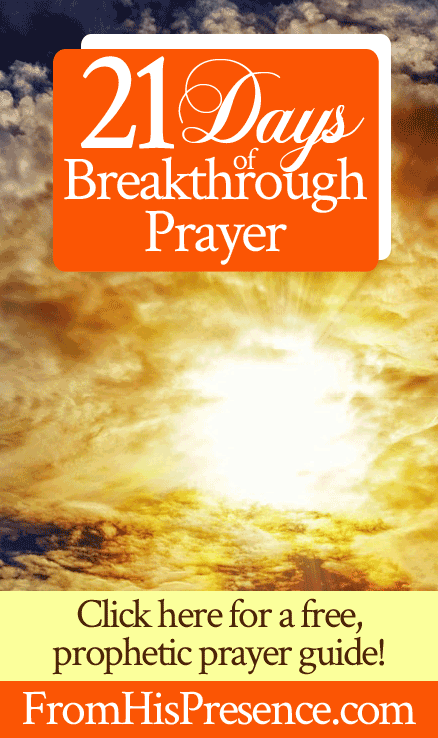 Welcome back to 21 Days of Breakthrough Prayer! This simple series will provide you with Scriptures to pray into for 21 days, asking the Lord for your breakthrough. Today, we are praying for a thousandfold increase. May the Lord God of your fathers make you a thousand times more numerous than you are, and bless you as He has promised you!” (Deuteronomy 1:11 NKJV). Thank Father God for how far He has already brought you. Thank Him for bringing you through the land of your [proverbial] enemies, for your enemies stood between you and the Promised Land–and now you are that much closer to crossing over into the Promised Land. Thank Him for being with you and going with you every step of the way. Remind Him carefully, one by one, of each of the promises He has promised you. Don’t leave any promises out! Remind Him of where in His Word He promised you each of those things. Tell Father God ‘thank You’ for all these things, and ask Him now to do each of the things He has promised you NOW. Ask Him to give you a thousandfold increase of every good thing He has already done for you. Then thank Him for your thousandfold increase! Thank Him for blessing you as He has promised you! That’s our breakthrough prayer for day 8! Oh my did this help me. It boosted my faith level off the charts. It also reminded me of some forgotten promises. Living in expectation. ?? Thank you Jamie for this verse from Dexter on om , it came in the right time . God bless you . Thank you for your wonderful site. It has lifted me up and helped me in a time of uncertainty and trial. I am asking for a breakthrough in an area and I am trusting God that He will do as He has said He will do! Just wanted to let you know that this 21 Days of Breakthrough Prayer is just leaving me spiritually wrecked! Such a blessing! My sister gave me a new journal for 2019. Holy Spirit prompted me to begin writing my prayers in this journal on December 1st when we started this 21 days of prayer. This prayer series has provoked so much conversation with Papa God that the journal is already almost half-way filled! Thank you so much for this powerful gift! Karen, this is an amazing testimony! Thank you so much for letting me know! Praising Jesus with you!! Wow this have really helped me to go back to God and remind him of all the promises He made to me and they are yet to manifest. With this am hopeful again. Dear sister Jamie, I’m being very blessed by these devotionals! I’m praying for your husband’s surgery to go well and for healing through this process, I am also praying that the Lord will send angels your way in the form of people to help you bear the responsibilities you have.